Some things you just never get tired of, no matter how many times you’ve been there or done them. 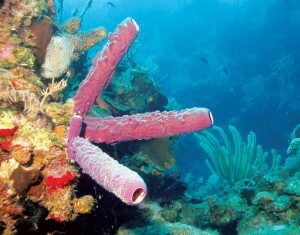 Spending time topside and especially, underwater, in the Turks & Caicos Islands are tops on Barbara Shively’s and my list. For the past decade, Barb and I have had the great pleasure of writing and providing the photos for this column, showcasing the extraordinary marine life we’ve experienced in TCI’s inviting turquoise waters. 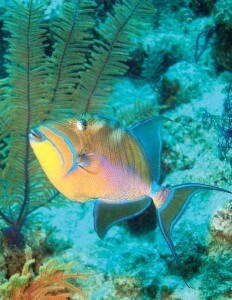 In fact, she and I met by literally bumping into one other on a dive boat on Grand Turk in 2004. We quickly realized that our shared passion for diving, particularly in these pristine waters, was more than an adequate basis for a lasting friendship. And so for nearly ten years, we’ve had the privilege of sharing that passion with other visitors to the TCI, as well as residents. Barb and I met on Grand Turk, but I’ve also spent many memorable hours diving and snorkeling on Providenciales, Salt Cay, and South Caicos—with scores of regal spotted eagle rays and a divemaster who shared my love for diving as well as my birthday. 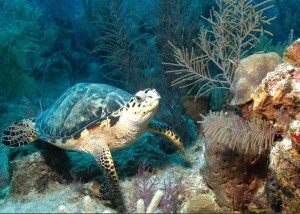 Recently I was diving in another island chain in the Caribbean with some newly minted divers. All were very realistic about their fumbling skills and apologetic for “holding me back.” I appreciated their humility, but I told them that diving with passionate beginners was actually deeply gratifying because it gave me the opportunity to see things through their fresh eyes. It’s folks like them who insure that I’ll never get jaded or take that sublime domain for granted. While my diving career will, hopefully, continue for decades, Barb’s has reached its natural conclusion. She and her husband continue to explore the topside wonders of this amazing globe, but no longer the “inner planet.” Still, she and I are deeply committed to sharing our passion with new (and not so new) divers and snorkelers, and especially imparting the vital lessons of conservancy. As on land, we need to bring our full consciousness and commitment to everything we do in the water. Every action has consequences, whether it’s fishing or touching or molesting critters or inadvertently hitting coral with our fins or equipment. According to NOAA’s Coral Reef Information System, one-tenth of all coral reefs on the planet have already been damaged beyond repair. Citing experts, they predict that if we bipeds don’t do something to alter these circumstances, by 2050, upwards of 60 percent of our reefs could be completely destroyed. The problem arises from a perfect storm of factors. The greatest threat is climate change, including El Niño patterns, worsening hurricanes, and coastal erosion. Aggressive fishing practices—like dynamite blasting, trawling, and the employment of longlines and traps—extract a huge toll on ecosystems, as do pollution, coral harvesting, and oil, gas, and mineral exploration and extraction methods. We humans are not exempt from this list. Divers and boaters can wreak havoc on reefs when we bang into them. One careless spin of a propeller or fin kick can undo several years’ worth of growth of hard or soft coral—possibly decades. It heartens me to see more and more people taking up watersports, including diving. But if we want to continue to enjoy the beautiful, beckoning waters of the TCI and elsewhere on the planet—and have them around for our children and grandchildren—we must become stewards of these precious resources. As they say in many dive locations: Take only photos, leave nothing but bubbles. For this our final column together, Barb and I wanted to shine a (dive) light on a few of our favorite underwater delights: kind of a “greatest hits” collection. Between us we’ve logged well over 1,000 dives, yet every time we (wet) suit-up and break the water’s surface, a tingling excitement arises like internal bubbles at what awaits us. There’s a truism in diving that new divers tend to pay more attention to the bigger critters—and with good reason. For one thing, they’re easier to spot. Plus they’re so dramatic. Turtles, rays, and sharks are pretty hard to miss in the water, though as any underwater photographer will attest, that doesn’t insure a good shot. Oh, Barb: You make it look so easy! We’re also attracted to colorful fish, like the stunning Queen Triggerfish and angel fish that Barb has captured so majestically. But whether beauties or funny faces, they all seem to exhibit signs of their unique personalities. As one gains more mastery and becomes more comfortable in the water, s/he starts to slow down and watch for interesting behavior, like hunting and feeding or mating rituals. Part of what makes the underwater canvas so extraordinarily beautiful is the juxtaposition of critters and corals and sponges. As Barb has noted, it’s like God has designed the ultimate stage set. 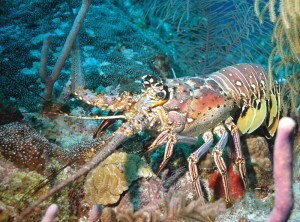 And hiding in those nooks and crannies are rewards for the patient diver: shrimp, lobsters, and the reclusive octopus. 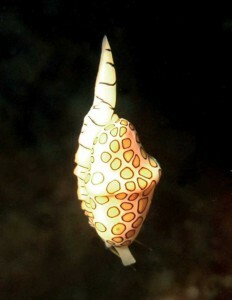 We love the tiny treasures too, the ones that escape the gaze of impatient divers. I’ve always been bewildered by how fast people move underwater. Where are they going? The show is taking place . . . everywhere! 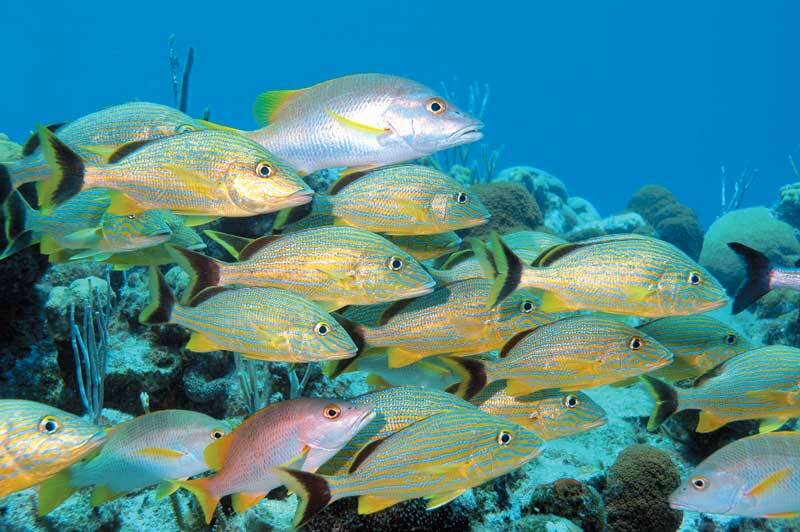 Slow down and take your time scrutinizing a small section of reef. That’s where you’ll find the real gems. Patient divers are rewarded with views of miniature 3-D masterpieces like nudibranchs, mollusks, hermit crabs, sea pearls, and even delightful worms, like the Christmas tree variety. Barb and I aren’t the type for sentimental parting words, but there is one thing we’d like to share. Vacationing and diving in the Turks & Caicos Islands are among the abiding joys in our lives, and sharing this column with you has enriched our lives on many levels. If in any small way we’ve brought you joy—or inspired you to learn to dive, or to dive more often or more responsibly—we are extremely grateful for having had that opportunity.